Are you looking UPSC CAPF Notification 2018 ? Do you want to apply online for UPSC Assistant Commandants Recruitment 2018 ? If yes, then here is good news for you. Union Public Service Commission has recently published employment notification for filling up 398 CAPF Assistant Commandant vacancy. Candidates who are interested and eligible may apply online for UPSC AC Vacancy either here or official site. The last date of online registration is 21.05.2018. Furthermore, information about UPSC CAPF Recruitment you can collect from below article. Union Public Service Commission is inviting online application for 398 CAPF Assistant Commanded Vacancy. Candidates who are interested for UPSC AC Recruitment can apply online here. The online registration form already available here or official site from 25.04.2018. More information of UPSC CAPF AC Recruitment like eligibility criteria, application fees, selection process, how to apply and other are mention below. Brief Information of UPSC CAPF Notification 2018 – What is the General Details of UPSC AC Notification 2018 ? What is the UPSC CAPF Eligibility Criteria / UPSC CAPF Notification 2017 Required Qualification ? Applicants who want to apply for Union Public Service Commission AC Online Form must ensure that they are eligible or not. Details of eligibility like qualification, age criteria, physical standards are mention on below section. So all candidates who are going to apply for UPSC CAPF Notification 2018 must check eligibility criteria. Applicants who are interested in UPSC CAPF Jobs must hold Bachelor Degree in any discipline from recognized university. Applicants who are appeared in last year Graduation examination are also eligible. Furthermore, details of qualification check UPSC CAPF Notification 2018. The age criteria is calculated as on 01.08.2018. Applicants minimum age required for Union Public Service Commission CAPF Notification is 20 years. Candidates should not be more than 25 years. upper age relaxation is applicable as per govt. norms. Before apply for Union Public Service Commission CAPF Recruitment also check given below PET details. Selection of the candidates will be made according to written test, PSD, PET, Personal Interview. UPSC CAPF Notification 2018, first written test organized at various centers. Written exam qualified candidates will attend the Physical Standards. And then after shortlisted candidates for UPSC Assistant Commanded Jobs will call for an interview. Final merit list will prepare according to marks obtained in written test, Interview/Personality test. More information on Selection Criteria mention below. If you are going to apply for UPSC Assistant Commandant Notification 2018, you must require paying an application fee. The details of fees are mention in below section. Fees will be payable either online or offline mode. If you are going to pay offline application fees than generate challan form and must submit to any SBI Branch. If you are selected for UPSC Assistant Commandant Vacancy, you will receive an attractive salary. Details of pay scale you must require to check official advertisement. Interested and eligible candidates may apply through online mode for Union Public Service Commission AC Jobs. 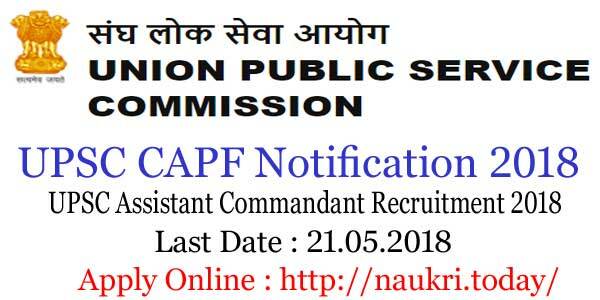 The online registration of UPSC CAPF Vacancy starts from 25.04.2018. Closing date of submission application form is 21st May 2018. If you are going to fill UPSC AC Recruitment 2018, you must have valid email id, mobile no. and scan copy of documents. How to apply for UPSC CAPF Recruitment 2018 is mention on below section. First of all, go to official site upsc.gov.in. Download Union Public Service Commission CAPF Notification 2018. Read full advertisement carefully and go to official portal upsconline.nic.in. Then click to part –I registration. Enter all basic details like personal and educational. Submit your part –I registration for UPSC Assistant Commandant Vacancy. After that you will receive a unique id and password. 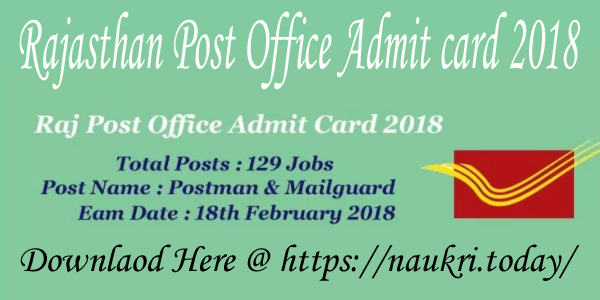 Then submit part –II registration of UPSC CAPF Jobs 2018. Take print out for future uses and keep also registration no. & password for future reference. Conclusion : Union Public Service Commission has announced recruitment for 398 CAPF Assistant Commandant Vacancy. The online registration for UPSC CAPF Notification 2018 started from 25.04.2018. Applicants can fill the UPSC AC Recruitment online form till last date 21.05.2018. Dear Applicants, Union Public Service Commission has released CAPF AC 2017 Notification. There are total 179 Assistant Commandant Vacancy in CRPF, BSF, CISF & SSB . Applicants who are looking for UPSC CAPF Notification 2017 can fill online application on or before the last date. Before applying online form candidates should check CAPF AC Eligibility Criteria. Closing date for submission of UPSC Vacancy 2017 Online form is 05.05.2017. Union Public Service Commission is inviting online application for recruiting candidates on 179 CAPF AC Vacancy. Those applicants who are are waiting for UPSC CAPF 2017 Notification have a chance to fill online form. Filling of UPSC CAPF Online Application has been started from 12.04.2017. For more information about UPSC Eligibility Criteria, Age Limit, etc. you can check from given below details. CAPF AC 2017 Exam Education Qualification : Applicants must have done Bachelor’s Degree in any stream from any recognized University for UPSC CAPF AC Exam 2017. Candidates should also meet Physical & Medical Standard for UPSC Recruitment 2017. For more information, you can check official notification. UPSC CAPF Age Limit : Minimum age of applicants for UPSC CAPF Notification 2017 should be 20 years & Maximum age must be 25 years as on 01.08 2017. Relaxation in age is applicable up to 05 years for SC/ST Category & 03 years for OBC Category candidates for UPSC CAPF 2017 online form. Application Fee For UPSC CAPF 2017 Vacancy : Male Candidates of General/ OBC Category need to pay Rs. 200/- for filling UPSC CAPF 2017 Online form. Other category candidates (SC/ST/Female) no need to pay any application fee for UPSC CAPF AC Application Form. UPSC Recruitment 2017 Pay Scale : Selected candidates will paid pay band for UPSC CAPF vacancy as per Department norms. you can check Pay Band details from UPSC CAPF Notification 2017 which is mention below. Selection Criteria For UPSC CAPF (AC) Exam 2017 : Selection of the candidates for UPSC CAPF AC Exam 2017 will based on given factor. If candidates will cleared all the Examination will selected for CAPF AC Vacancy 2017. Department will conduct online written examination for UPSC Vacancy 2017. which will divided in to two parts. 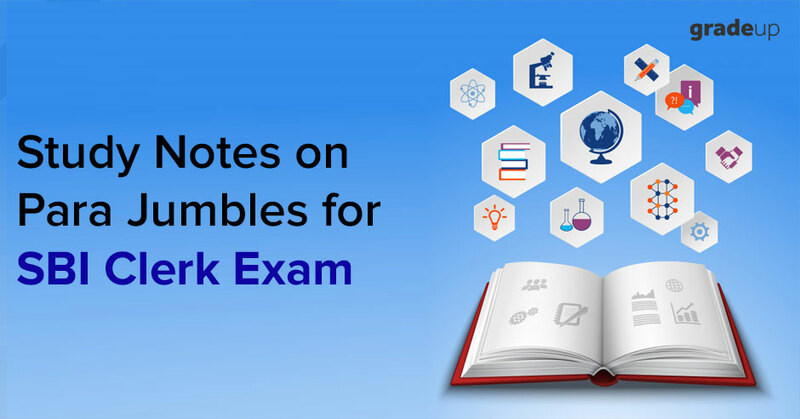 Paper I will contain General ability & Intelligence Subject Question of total 250 Marks.paper II will consist General studies, Comprehensions & Essay question of 200 marks. Candidates should get minimum passing Marks in both Examination for qualifying the CAPF AC Exam 2017. After that selected candidates call for PST,PET & Medical Examination. If candidates fulfill all eligibility Condition will appear in Interview round which is of 150 marks. Final Selection will base on Merit List. Merit List will display on official website after Examination. You can check more details about UPSC CAPF 2017 Exam like Exam Syllabus, Admit card etc. from here. Keep in touch with this page for future updates regarding UPSC CAPF Notification 2017. How I Fill Online Form For UPSC CAPF Notification 2017 @ upsc.gov.in ? First of all candidates visit to the official website www.upsc.gov.in. Now click on UPSC CAPF 2017 Notification link. If you are eligible then click on Apply UPSC CAPF 2017 Online form link. Fill all details in form without any mistake in registration form (Part I). Then click on part II registration link. Upload your recent passport size Photo & Other documents properly. Click on submit button after check all details. UPSC CAPF Notification 2017 for 179 Assistant Commandant Vacancy. Candidates can fill online form for UPSC CAPF AC Exam 2017 on or before the last date, that is 05.05.2017.